A zoning ordinance amendment being suggested by Fairfax County could result in Reston’s population increasing threefold by 2050, community advocates say, and local residents are being encouraged to speak out against it. 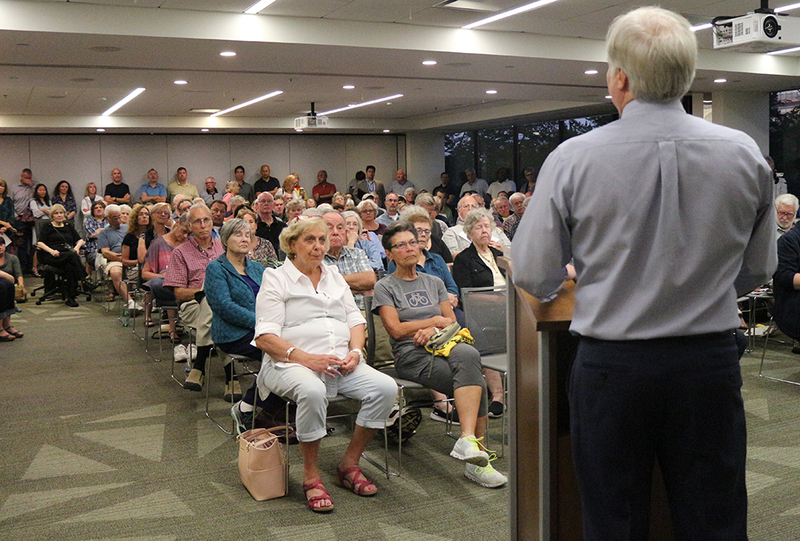 Reston 20/20, Reclaim Reston and the Reston Citizens Association presented a community information session on the County’s proposal Wednesday, attended by more than 100 concerned Restonians. The goal of the event was to help residents learn more about what the amendment means and to prepare them for a fourth public meeting on the proposal, being presented by Supervisor Cathy Hudgins at 7 p.m. Monday at Lake Anne Elementary School (11510 North Shore Drive). The first three meetings on the proposal, held in May, were not seen as adequate by many Restonians who attended them. 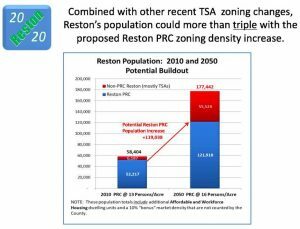 The proposal from the county’s Department of Planning and Zoning would bump the overall limit on people per acre in Reston’s Planned Residential Community (PRC) District from 13 to 16. (The density is currently about 11.9 people per acre.) The PRC District does not include any of the Transit Station Area property surrounding the Wiehle-Reston East and Herndon Metro stations, nor does it include most of the property in the Reston Town Center Metro station TSA south of the Dulles Toll Road. The ordinance amendment would also allow for the Board of Supervisors to be able to approve individual developments in excess of 50 dwelling units per acre in TSAs within the PRC and when in accordance with Comprehensive Plan recommendations. Those areas that would be marked for major residential development include all of Reston’s village centers. If the zoning ordinance were to go into effect, Hays said, it would be akin to the genie being let out of the bottle for development all over Reston. “Once it’s a zoning ordinance, it’s done; it’s over; there’s not much we can do, ever,” he said. According to numbers presented by Terry Maynard, co-chair of Reston 20/20, the proposed changes combined with high-rise development in TSAs could result in Reston’s overall population increasing to more than 177,000 by 2050. John Mooney, representing Reclaim Reston, said that even by conservative estimates, this would increase peak-time traffic in the community by nearly double if infrastructure needs are not addressed concurrently. In addition to a lack of adequate streets to accommodate the increased population, Maynard said the lacking infrastructure would also include a deficit in schools and parks. 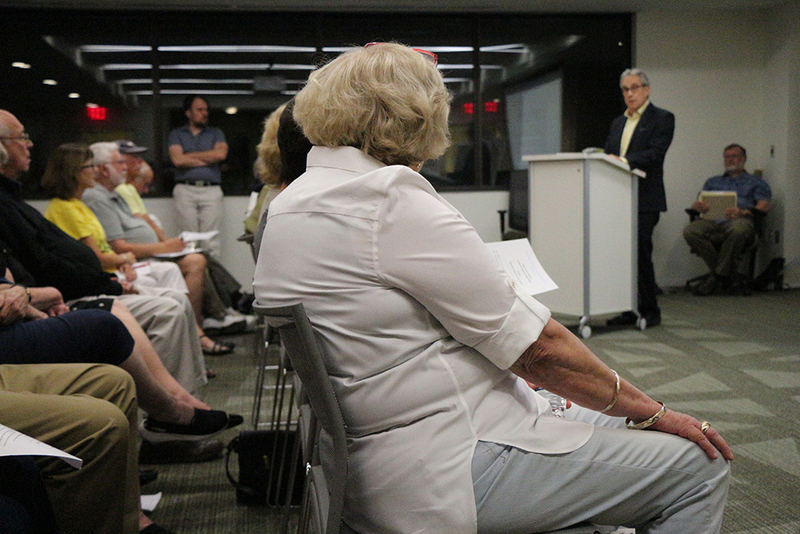 Concerns about police staffing, fire coverage and more were also brought up by other residents. Residents were encouraged to show up en masse to Monday’s meeting, to let Hudgins and county staff know that they do not want to see Reston grow out of control. They were also requested to call Hudgins’ office and leave messages relaying their displeasure. The DPZ had originally hoped to bring the proposed amendment before the Board of Supervisors in July, followed by a Planning Commission public hearing in September and the Board public hearing in October. It now has those projected dates pushed back to November, January and February, respectively. If Reston residents who attended Wednesday’s meeting have their way, though, the end result will be the proposal being left by the wayside until more pressing concerns are met. Restonians who want to learn more should contact representatives of Reston 20/20, Reclaim Reston and/or the Reston Citizens Association. Del. Ken Plum: Never Armed Enough!